Prince Elector Carl Theodor built the Old Bridge in 1786. Although the fifth bridge built over the Neckar in this location, it was the first stone bridge to be constructed. The twin towers on the city side of the river were once part of the city wall, and contain dungeons used for housing criminals. In the center of these, hanging above the portcullis, is a plaque giving acknowledgment to Austrian troops who helped defend the bridge against a French attack in 1799. 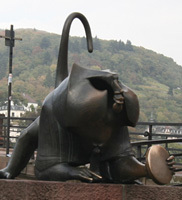 One of the most notable items on the bridge is the statue of a monkey holding a mirror. The legend surrounding this curious statue tells us that it symbolizes the fact that neither the city-dwellers nor the people who lived outside the city were better than the other, and that they should look over their shoulder as they cross the bridge to remember this.